The SanDisk Ultra Dual USB Drive is great for the Droid enthusiast. It's a snap to use, it's inexpensive, and it serves a real need. But if you're not a Droid enthusiast, it's just a novelty product with no immense value. As a Droid User with a Samsung Galaxy S4 Active, I find that transferring files is always a nuisance. Partially because I primarily work on a Mac, but also because I find the software that is used to pair my Droid to my computer is just awful. The SanDisk Ultra Dual USB Drive is a great way to mediate the challenges of transferring files to and from your OTG-enabled Android device. You just plug in the SanDisk Ultra Dual USB Drive into your Android, or Windows/Mac OS X computer, and transfer files. On the Android, the SanDisk Ultra Dual USB Drive mounts automatically and you can access files from the device directly or copy them locally. 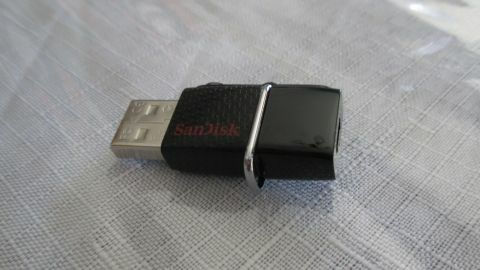 On a computer, the SanDisk Ultra Dual USB Drive pops up just like a normal flash drive, which allows an easy drag-and-drop methodology to transferring files. The drive makes it easy to manage your files on the go, especially if you're a power user and never have the time to unload your SD Card on your Android. No prep needed for transferring files here - you just copy and plug in. The SanDisk Ultra Dual USB Drive is a small thumb drive with a slider that enables you to switch between a USB 3.0 connector and Micro-USB connector. When I say small, I mean small, as the SanDisk Ultra Dual USB Drive itself measures only 0.43 in x 0.78 in x 1.44 in (11mm x 19.8mm x 36.6 mm). The SanDisk Ultra Dual USB Drive comes in three different sizes: 16GB, 32GB, and 64GB. The cost of the different models won't hurt your wallet. The cost of the SanDisk Ultra Dual USB Drive 16GB model is $12.35 (£8.31, AU$16.18), 32GB is $18.98 (£12.77, AU$24.86), and 64GB is $36.25 (£24.39, AU$47.48). Be aware: the sliding mechanism is cheap and feels flimsy. The casing is good, but mine broke when I was taking the device out of my USB port. The drive still works but the casing is shattered. But I guess this is to be expected for such an inexpensive device.